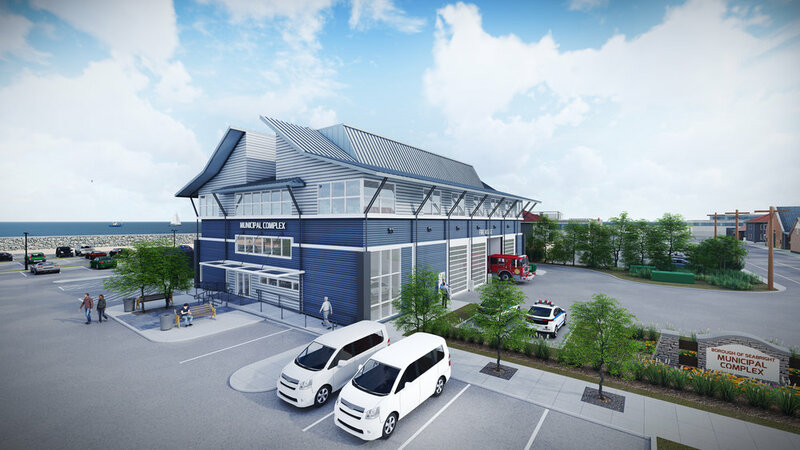 The Sea Bright Emergency Response Center is intended to replace the existing Fire Department, Police Station, Administration and EMS, which were severely damaged by Superstorm Sandy. The existing buildings are located at 1099 Ocean Avenue and lie just inland of the beach. It is on this site that the new center will be constructed, containing enough space for the Fire Station, Police Department, EMS Services and an Administration Area for a total of 11,400 gross square feet. In the case of the Fire House, all vehicles and their support equipment are located at the first floor level with direct access to the street. The Sally Port + Processing Center are the Police component located at street level, while the EMS component has parking for an ambulance and a treatment space. An entrance foyer completes the accommodation assigned to the ground floor. The second floor level is divided into three distinct zones. Administrative functions occur along the east and west edges with the larger communal space located between the two. The spaces are arranged so that they can be shared by the Police and Fire Departments without compromising the security requirements of the Police Department. The resultant building form is a simple two story box of similar scale to the surrounding commercial buildings. The building’s external expression borrows elements from local Sea Bright architecture. Openings in walls are of the punched type with white trim. The proposed building uses three elements and colors to breakdown it’s scale and box like form.